New non-invasive test predicts long-term death risk in humans even without heart disease symptoms. A new non-invasive scan can be used to determine the extent of plaque buildup in the heart accurately predicts the likelihood of heart attack or death over a 15-year period. This test from researchers at Weill Cornell, Emory University and Cedars-Sinai predicts the risk of heart attacks better than any other diagnostic heart test currently available, especially in asymptomatic patients. The team state the it embodies the goal of precision medicine, namely, to precisely identify and exclude the patients who have or do not have disease that places them at heightened risk of heart attacks. The current study shows that doctors can use this information to intervene if a patient is shown to be at risk for heart disease and not yet showing any symptoms. The researchers state that all high-risk individuals, irrespective of their symptom status, should be considered for this study which is like a mammogram for the heart. They go on to add that if physicians can accurately predict who is at risk, they can intervene earlier and more aggressively and hopefully prevent patients from ever having a heart attack. Previous studies show that heart disease is the number one cause of death in the United States, killing 40 percent more people than all types of cancer combined. However, while there are routine screens for many types of cancer, like breast and prostate, there isn’t a universally adopted test used to check for heart attack risk in people not exhibiting any symptoms associated with heart disease. The current study demonstrates that the coronary artery calcification test, a five minute-long procedure that examines the total amount of calcified plaque buildup in the heart arteries, should fill that void. While previous studies have connected coronary artery calcification test results and long-term patient prognosis, the current study is significant for its size and scope; it looked at the largest patient population over the longest period of time. The current study reviewed the medical records of 9,715 patients in the area surrounding Nashville, Tenn., who were referred by their primary care physician to a single outpatient clinic from 1996 to 1999. Physicians at the clinic gathered basic demographic information along with patients’ cardiac risk factors, including history of diabetes, elevated cholesterol levels, documented high blood pressure or family history of coronary heart disease. All patients then underwent a coronary artery calcification test. The Calcium, or Agatston, Score goes from zero, representing a normal scan with no calcium at all, up to more than 1,000. Within the study, the participants were grouped by their resulting number in the following configuration: zero, one-10, 11-99, 100-399, 400-999 and more than 1,000. The team explain that more than 1,000 is considered the worst case scenario, with imminent risk. However, over 400 is severely elevated. It’s all very linear and predictable. After collecting this de-identified data the status of all participants was tracked through the National Death Index, a central computerized index from the National Center for Health Statistics. The patients were followed for a mean of 14.6 years. With the Calcium Score and cardiac risk factor used as variables the team calculated the risk that participants would die for any reason, not just because of a heart attack, called all-cause mortality. They then compared this long-term prognosis against what actually happened, and found that the Calcium Score was highly predictive of all-cause mortality. The results showed that during the 15 years, 936 study participants died at the rate of 3, 6, 9, 14, 21 and 28 percent, respectively, compared to the increasing Calcium Scores. The researchers state that in all asymptomatic patients, someone with a score of zero has a minimal risk that they will die from any disease in the next 15 years. It’s a very long-term warranty period. They go on to add that on the other hand, if a patient has any calcium in his heart, he or she is at risk. The team surmise that the medical team must intervene quickly and aggressively for patients’ future health because that risk never goes away. They go on to conclude that the medical community has the correct medicine that saves lives; they just need to have the technology to identify the right patients earlier to give them the correct treatments. 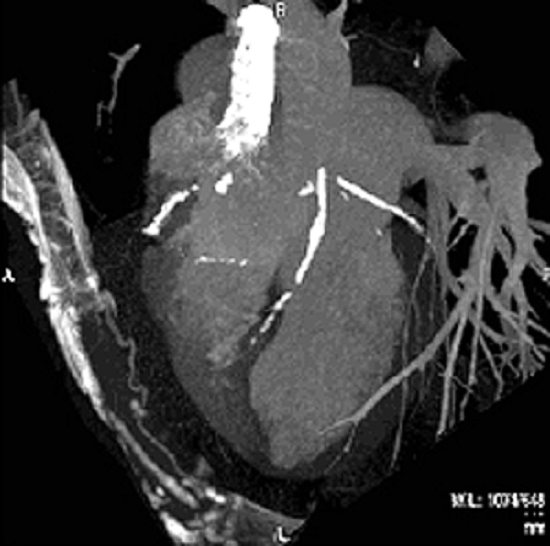 Three-dimensional visualization of a CTA data set showing calcifications in coronary arteries. Credit: Departments of Radiology (M. Kock, A. van der Lugt) and Cardiology (K. Nieman), Erasmus MC.